Britches of Georgetown was a national clothing retailer. 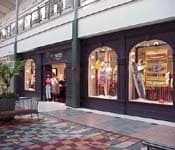 Their flagship location was in the heart of Georgetown on Wisconsin Avenue. After several changes in ownership they filed for chapter 11 bankruptcy on December 28, 2001 and by 2002 they had closed all of their remaining stores.